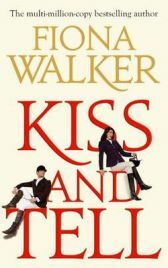 The first thing you will notice when picking up ‘Kiss and Tell‘ by Fiona Walker is just how long it is. With just under 900 pages, reading this book is just like running the London Marathon or going on a long haul flight. You need to have both the time and the motivation to see it through to the end! My first inclination was not to bother with it knowing that my concentration span usually only covers books that are half that length. However, I did persevere and I am actually glad that I did as I found myself being caught up in the colourful and, at times, seedy world of equestrianism. There are a host of characters in this book and numerous story lines to follow so you do need to concentrate. To start with it felt like hard work keeping up with who everyone was even though there is a cast list and explanations about how they are all related at the beginning. I did refer to this a few times but found that I was soon able to work out who was who for myself. The two main characters are Tash and Hugo Beauchamp, a glamorous and successful couple in the world of three day eventing. However, after two babies, the shine seems to have gone off both their marriage and their equestrian success. There are temptations galore for both of them as they attempt to keep on competing, run their stables as well as bringing up their young family. Communication breaks down and they both believe the other capable of affairs, especially as Hugo is often away from home for long periods of time. It makes for an absorbing if not uncommon situation set against the intriguing backdrop of this fascinating and precarious sport. Many colourful characters are introduced and they all have the sport in common, including the likes of rock star, Dillon Rafferty and glamour girl Sylva Frost. There are many affairs but also unrequited love; a race to lose virginity; some underhand dealings and lots of intense competing as we follow a year or more in the eventing calender. So much happens in this book that it would be impossible to provide an overview of even half of it! Having said that though, all of the stories work and interweave with each other well, and I found that from about halfway through I was truly caught up in all the comings and goings. I enjoyed reading about all of the eventing competitions and the horses but I cannot comment on the authenticity of it all as it is a sport that I know very little about. Also because of the nature of the sport, most of the characters were what I would describe as upper class and their way of life was not one that I could easily identify with. This does not mean that this is a book that you could not enjoy if you knew nothing about the sport because it is essentially a story about old fashioned love and misunderstandings! Fiona Walker is also likened to Jilly Cooper and I guess that this book would appeal to her fans too. Overall ‘Kiss and Tell‘ is a very enjoyable read but unfortunately, in my opinion, it is too long. I almost feel that Fiona Walker could have written two books out of all the material she has here. I guess you could say that you do get great value for money with all those pages though, as the RRP is the same as for books half its length. If you do have the time to sit down with this book and fully immerse yourself in the different stories, it will be well worth it. Just make sure you have the stamina before you start! Thanks to Little, Brown Book Group for sending a review copy. No Comments on "Kiss and Tell"